The reason for this column was pretty simple: while being the phones and tablet editor for techradar, my hobby was running - and I wanted a place to be able to just dump all my experiences with the latest running gear (which you can't really do in the latest iPhone review). It's been ace: I've tried the latest running watches, tested the Apple Watch on multiple Parkruns, improved cadence with the Moov and generally vented on something that a lot of people don't care about (but those that do, REALLY do). Every so often I get sent things that aren't really tech though - or perhaps not a lot to do with running (the latter being a hangover from me attempting to do a triathlon). The thing is, if there's not a lot of tech involved, it's hard to stick them in the 'Running Man of Tech' column - but there have been some notable exceptions that I really want to talk about. So the following items might not be necessarily tech-based (or running) but they ARE awesome and things I genuinely use all the time, and I'll do my best to pretend that there's something tech about them. There are a couple of things I respect about Inateck: firstly, it's a brand that seems to just make things it thinks of. Everything from a USB charger to running headphones…and inexplicably a running belt too. The second thing is the naming. It's just the name of the thing. Inateck Bluetooth Headphones. 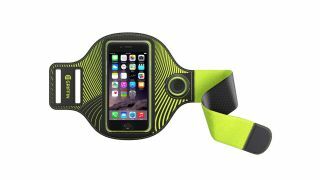 Inateck Sweatproof Running Waist Pack. It's almost like it's aiming for search terms on Google and Amazon. I like this belt a lot though. It's really discreet, and I thought only had space for a couple of gels. But you can shove nearly any size of phone in the first pocket, which expands inexplicably through some clever folding - and still have space for gels further around. It's pretty cheap, and with an elasticated strap is really comfortable - it can even go under your top to be really discreet. Reason it's tech: Erm… physics. It defies them with the foldable pocket. That's smart engineering. Which needs tech. I got given this last Christmas (when I was expecting a heart, but whatever. I would have just given it away) and despite the fact it looks like an actual purse, it's ace. It's a normal pouch with magnets, where you fold one part into your shorts or whatever and stick your phone / keys / gels on the outside section, and then just bring the two together. They close with an impressive amount of force, and this thing will struggle to fall off. In fact, it's more likely to drag your shorts down, so be VERY READY FOR THAT AND TIE THEM UP TIGHTLY. Seriously. Trust me on this. Again, it's not overly expensive and worth trying out if you don't want straps around your waist or an armband. Reason it's tech: Magnets. Science. Technology. Magnets. This is mostly just an armband, but it's a very well made one. What's more, it has cutouts in all the right places, and as someone who uses a million different phones a week, this kind of variation is welcome. You can use fingerprint scanner, hit menu buttons and more - all useful when running and you don't want to remove it. The key thing here is the LED though - there are lights infused all around the outside, and with a tap of the wonderfully tactile button you can have solid, flashing or faster flashing, which is perfect for when you want to be seen outside. It's a little more expensive at £30 / $40 / AU$56, but the lighting is really comforting when you're trotting down dark country lanes. Reason it's tech: Diodes running down neoprene pipes or something. OK, this one isn't as much non-tech as it is non-running - but it was sent over for me to try out and I felt the need to talk about it. It's a front bike light that costs £125 / $195 / AU$270, but it's incredibly well made, machined from metal. The key difference here is that not only do you get a blindingly bright light, but also a laser beam. Yep, lasers. Frickin' lasers on your bike. These don't burn through the cars in front thankfully, but they do warn them of your presence. The light projects a bike image onto the road around 10 feet in front of you (although this can be altered) that will alert pedestrians and turning cars that you're there. "I wanted to make the bike visible when they were otherwise invisible. I wanted to make you seen before you would otherwise. Approaching a junction I found myself wishing I had a 'presence' just 5 yards ahead, warning drivers I was approaching," Emily Brooke, creator of the Laserlight, told me. People will look at you. People in cars will look at you. People walking on the street will look at you. In short: people look at lasers, and they will know you are there. In fact, my biggest worry is that it would distract drivers… but they'd definitely not turn into me any more. The reason for the higher cost, Brooke says, is that the lasers aren't just the same as the laser pointers we all use but a 'direct diode' which, along with the materials used in the highly-engineered build, make the high price more understandable. It's definitely an awesome light, and now I'm getting used to it I feel less ostentatious cycling back from work - with the added knowledge at roundabouts that cars are less likely to pull out in front of me. Reason it's good for running: Not being hit by cars makes it easier to run. Cycling is good cross training. But mostly the hit by cars thing. And if you want to get the full lowdown on the latest and greatest running tech, read the rest of the Running Man of Tech story here.